What many may see as a true representation of an artist is the ability to invoke emotion with a piece. Often, the relation goes both ways and the art itself is created as a result of sentiment, forming a dialog between the artist and the viewer through the narrative of the art piece. Such is the case with the Amsterdam-based artist going under the pseudonym of FAKE, largely inspired by the events, objects, and relationships that left a mark on him in the past. 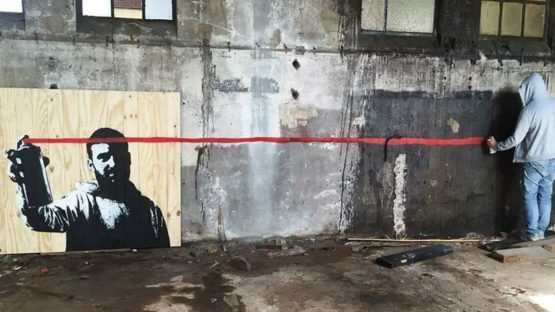 With a practice revolving around leaving an impression on the public, his works comprised largely of stencils can be seen both on the streets and within gallery walls. Born to the environment of Amsterdam in 1980, the Dutch artist has been expressing himself artistically for more than half of his life. Finding the open space and freedom of street art to suit him, he’s made his first artwork in a schoolyard, and he remembers it well even today. Ever since, he’s decorated the walls of numerous countries across the world, including United Kingdom, France, the Netherlands, Sweden, Indonesia, Thailand, and Belgium, among others. Although he has used different approaches, and is still looking to reveal his sculptural work, his foremost focus and a signature way of communication are stencils. Discovering just how powerful the stencils can be, FAKE never stopped using the medium, portraying various humorous, ironic scenes. Moving his practice inside the gallery walls, his pieces have received brightly colored backgrounds, providing yet another layer to the story. Depicting a witty scene in each one of his works, FAKE’s practice revolves around not the piece itself, but the reaction it will cause in the viewer. Inspired by objects, scenes, and relationships out of his own life, he seeks to draw out a smile through irony and humor that permeates his oeuvre. With his short stories ranging from FAKE LOVE to The Holy Vader, FAKE doubtlessly causes a reaction whether the audience consists of gallery visitors or street passer-bys. 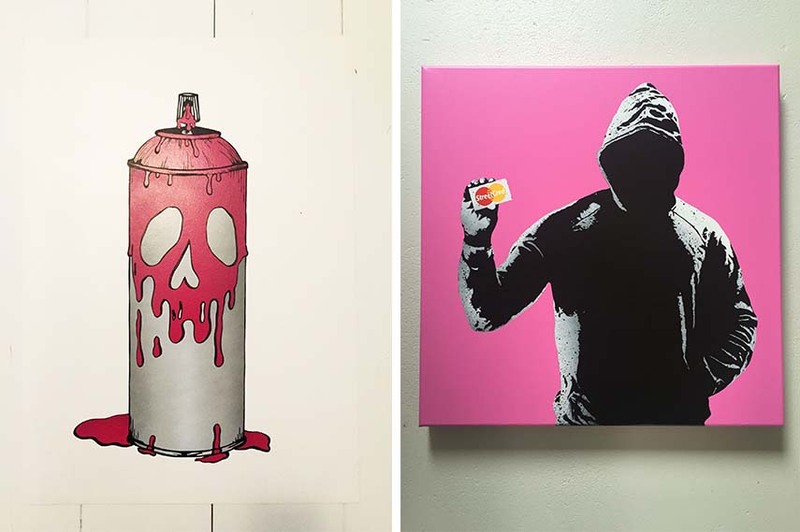 With stencils being a relatively young movement spreading mostly in the 21st century, its momentum can be attributed to its ease of distribution as well as the prolific, talented artists like FAKE that have been using it to communicate with the viewers. 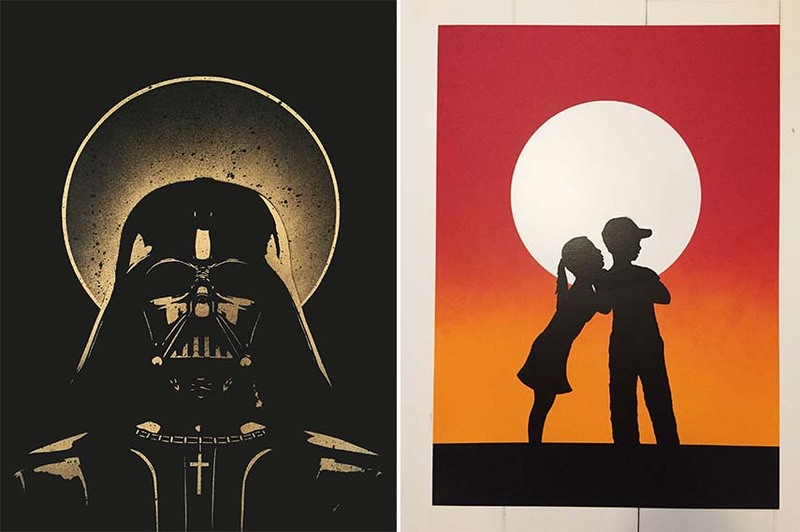 Doubtlessly impactful, a glance at any of his pieces leaves the subject with a grin signifying a deeper connection with the feelings that the artist himself was surrounded by. Whether you see them in the gallery or in the streets, on a canvas or straight against a wall, FAKE’s works are bound to change your day for the better. The artist is represented by Pretty Portal. FAKE lives and works in Amsterdam.